In her confirmation hearing this week to become the next U.S. attorney general, Loretta Lynch said that "no individual is too big to jail" and "no one is above the law." But, at least in one recent case in which Lynch was a key player, this may not be accurate. In 2012, the U.S. Department of Justice found that British banking giant HSBC plc and its U.S. subsidiary had permitted Mexican and Colombian drug cartels to launder hundreds of millions of dollars undetected, and had conducted business illegally with customers in countries sanctioned by the United States. "HSBC's willful flouting of U.S. sanctions laws and regulations resulted in the processing of hundreds of millions of dollars" in illegal transactions, the Justice Department wrote. This was not just innocent incompetence. For instance, the Justice Department said, "HSBC Group affiliates worked with sanctioned entities to insert cautionary notes in payment messages including 'care sanctioned country,' 'do not mention our name in NY,' or 'do not mention Iran.'" HSBC got off with a deal in which it would pay nearly $2 billion in fines, appoint a corporate compliance monitor and promise to institute significant reforms to prevent future wrongdoing. HSBC was not prosecuted. Nobody went to jail. This deal was signed by Loretta Lynch. For her part, Lynch defended the deal for its ability to compel systemic change at the bank. "They're obviously paying a great deal of money," she told an interviewer. "But they also have had to literally turn their company inside out." Well, it's been a little more than two years since the deal was announced. Let's meet the new HSBC. On Thursday, Public Citizen released a report enumerating a number of legal inquiries involving HSBC since the deal was signed. We omitted several recent allegations that appeared to stem from behaviors preceding the deal. But that still left plenty to talk about. In a little-reported disclosure in December, the Justice Department announced that the government was investigating U.S. taxpayers for evading taxes by using "multi-jurisdictional offshore services" company Sovereign Management & Legal Ltd. The services Sovereign describes on its website, conveniently located at www.offshore-protection.com, are so brazen that visitors would be forgiven for thinking that it's an IRS trap. For instance, Sovereign touts providing anonymous debit cards that "have the advantage of not having your name on the card, either imprinted on the front or magnetically encoded on the back so no paper trail is left behind." Brian Mahany, a specialist in offshore tax issues, wrote on his blog, "Long associated with tax evasion, offshore debit cards are a popular way for people with hidden assets to repatriate their money into the United States." HSBC holds "correspondent bank accounts" for Sovereign's banks in Panama and Hong Kong, the Justice Department said in December. Correspondent banks are often used to conduct business with banks in foreign countries. On its website, Sovereign lists HSBC among the institutions with which it offers bank accounts. 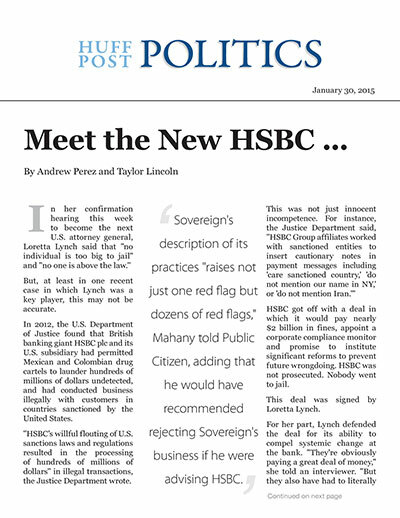 Sovereign's description of its practices "raises not just one red flag but dozens of red flags," Mahany told Public Citizen, adding that he would have recommended rejecting Sovereign's business if he were advising HSBC. In November 2014, Belgian prosecutors alleged that the Swiss private banking division of HSBC had engaged in "serious and organized tax fraud, money laundering and unlawful exercise of the profession of financial intermediary" from 2003 to the present. "The Swiss bank is suspected of having knowingly eased and promoted fiscal fraud by making offshore companies available to certain privileged clients," the statement said, "particularly in Panama and the Virgin Islands." Last week, the HSBC corporate compliance monitor appointed under its deal submitted a progress report to the Justice Department that is scheduled to be released in synopsis form in April. Reporting in anticipation of the submission, The Wall Street Journal wrote that it would "criticize the bank and lay out ways it needs to improve." it violated any U.S. laws or the terms of the agreement. Perhaps the synopsis of the monitor's report, coupled with the Justice Department's response, will give us insight into whether Lynch really meant it when she said that "no one is above the law."